Helicopter shot? No! iPhone panorama from the top of the Tour Montparnasse! Everybody hated the 59-floor Tour Montparnasse skyscraper when it was built next to Gare Montparnasse in Paris's 15th arrondissement (map) in the early 1970s. At 210 meters (689 feet), it was the tallest building in France, and utterly out of scale with the rest of Paris's mostly 5- to 7-storey buildings. After it was built, the city of Paris banned the construction of skyscrapers in the city center. In some ways, the Tour Montparnasse is still an eyesore: when you're standing on the terrace of the Palais de Chaillot, admiring the soaring height of the Tour Eiffel (Eiffel Tower), that boring skyscraper in the distance that you can't avoid in your photographs is the Tour Montparnasse. Not only that, it's usually much faster, easier and cheaper to view Paris from atop the Tour Montparnasse than from the Tour Eiffel. Ignore "Entrée"—look for the awnings on the left. Up on the terrace, the observation area is protected by glass walls and shelters, with plenty of bright sun (or rain, as the case may be). 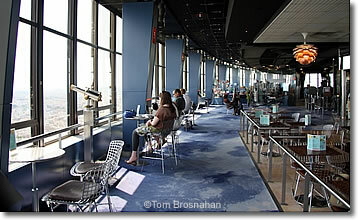 In a few places along the glass walls, gaps have been left so you can poke your camera through and get a clear shot. between the chairs is the Eiffel Tower. Tour Montparnasse 56 is open every day of the year from 09:30 am to 22:30 (10:30 pm; till 23:00/11:00 pm on Friday and Saturday), butthe last elevator/lift departs 30 minutes before closing. Admission costs 18€ for adults, 15€ for students with ID, about half price for handicapped visitors. Children under 4 years of age visit for free; those between 4 and 11 pay about half the adult fee, but family-pack tickets offer savings. 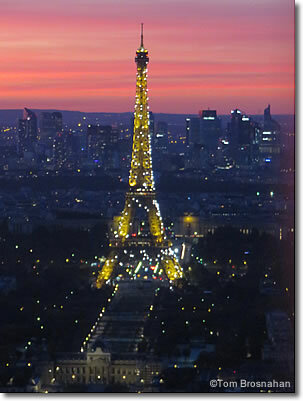 If you'd like to take a cruise on the Seine as well, save time and money by buying a combination ticket for the cruise and the Tour Montparnasse online, in advance, here. 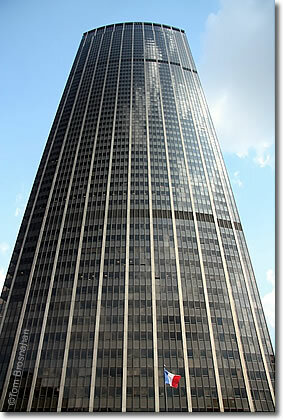 Above, the megalithic Tour Montparnasse. Below, Notre Dame from the terrace. 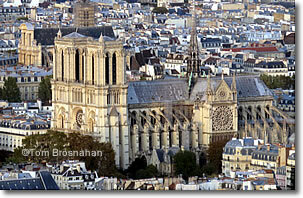 Notre Dame from the Tour Montparnasse. 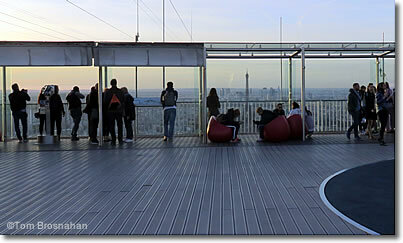 You can ony get this view from the Tour Montparnasse!